How should surgeons deal with cancer patients? The cornerstone of effective treatment is a multidisciplinary collaboration between many specialties in which surgeons are not only concerned about operative accessibility and technique but rather have a deep understanding of the fundamental biology of the malignancy they are dealing with and appreciate the reach of multi-modal treatment. This handbook is a practical reference for today's surgeons who actively manage cancer patients in both the acute and out-patient setting. It covers all the key areas, from initial presentation and diagnosis, investigation and staging, to active discussion in collaborative multidisciplinary cancer network meetings, operative management, post-operative care, and long term surveillance and palliation. Drawing together all the varied guidelines and source materials that form the basis of this complex subject, it is the first surgical oncology text that provides instant access to detailed clinical algorithms and operative techniques covering the wide range of cancers that general surgeons encounter, from GI tract to breast and endocrine cancers. 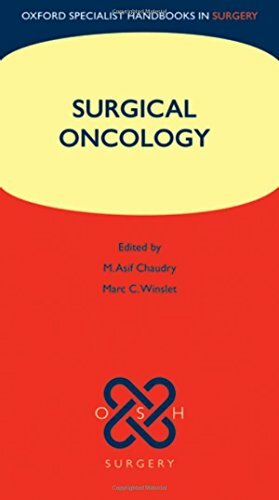 Consistently sourced from current evidence based guidelines with a concise summary of underlying pathology and molecular biology, Surgical Oncology will enable the reader to knowledgably manage cancer patients from initial assessment to long term surveillance. It is an essential accompaniment for all higher surgical trainees from MRCS to the exit FRCS and EBSQ exams, and will be particularly useful for trainees rotating between surgical subspecialties, as well as having wide appeal to other members of the multidisciplinary team.